4" black stick - Suitable for black, off black, darkest brown, etc. 4" chocolate brown stick - Suitable for off black, dark browns, etc. 4" light brown stick - Suitable for light ash browns. 4" golden blonde stick - Suitable for all blondes. 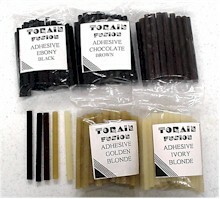 4" ivory blonde stick - Suitable for all blondes specially platinum blondes.